Perfect Companion For Your Essential Oil Collection! Great pouch to keep your oils organized at home, to conveniently travel with your oils, keep your favorites close to you everyday, or slip into a diaper bag, gym bag etc! Natural Cotten Linen Fabric Exterior, With A Beautiful Leaf Pattern! This pouch is not only practical for your oil needs, but very beautiful! Accent Details! 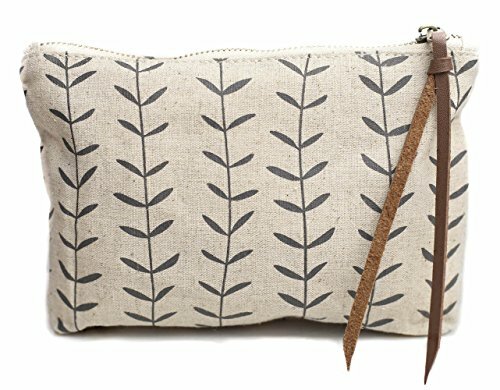 This pouch features a brown vegan leather strap and chrome metal zipper! Stay Organized! No more digging for oils at the bottom of your bag! This pouch has 8 fabric slots to hold your favorite essential oils safely on the go, or to store them neatly at home! Spacious and Convenient size- 8 1/2" L x 6" H- Holds 8 15ml Bottles, or 16 10ml Roller Bottles comfortably. There is also extra room in the middle to add other personal care or essential oil products when needed! This pouch is a soft case and fits comfortably into most bags and purses. It is not a hard bottom. It stores flat, and can sit upright when filled. If you have any questions about this product by Living Brilliance, contact us by completing and submitting the form below. If you are looking for a specif part number, please include it with your message.